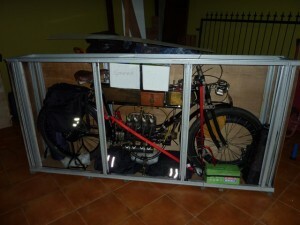 Paperwork aside, exporting the bike required crating and transporting it to the cargo handlers. Nothing is as it seems in Bali, especially when came to having the bike go through an x-ray machine. I received a call to say there were four “cannisters” that were suspect. By the time I got to the airport the crate had been broken open to reveal these were the bike cylinders certainly nothing volatile ! An hour later another call deemed the spark plugs to be dangerous and insistence that they to be removed in case they caught fire. This time I arrived to find the air had been removed from the tyres as well, in case they caused an explosion. All this was despite the fact the motorcycle had been airfreighted to Bali by the same airline. It was only when the plane touched down in Brisbane and the crate did not reveal any hidden contraband that I could breath a great sigh of relief.